If you are no stranger to natural living,you’ve probably already knew about using essential oil diffuser to improve health,increase your energy or help you sleep better,and there are some more,such as elevate mood,ward off illness,help you breathe easier,relieve pain and repel insects etc.You deserve one! 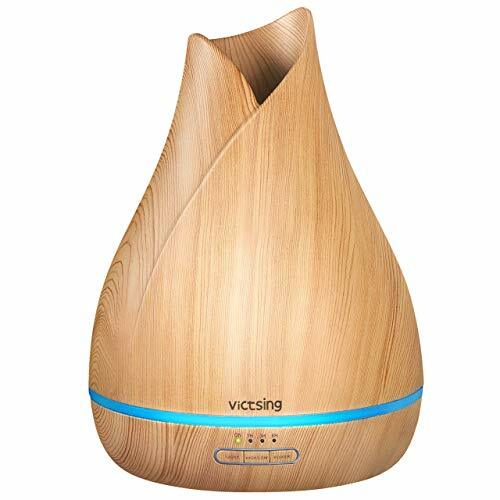 Besides used in aromatherapy, this essential oil diffuser also functions well as an small humidifier and night light.This ultrasonic aroma diffuser runs for 7 hours in high mist 14 hours in low mist mode continuously. Approved by CE,FCC,this 500ml essential oil diffuser is absolutely BPA-free,and has no harm to health.With the waterless auto-off and ultra-quiet design,this aroma diffuser can be put on your nightstand. There are so many options,why Choose Us? 1.Do not add essential oils through the mist output. 2.Clean the water tank for each oil changes because essential oils mixture may release unpleasant smell. 3.Do not use metal or hard objects to clean the oscillator. 4.It is an essential oil diffuser, but you can use it as a small humidifier without oils. 【SUPER QUIET】 This aromatherapy essential oil diffuser has reduce noise design, watering-retaining cover. Adopted ultrasonic technology, this aroma diffuser runs so quietly that you barely notice it. Ideal for office, spa, salon, Yoga studio, child's room, and physical therapy studios.